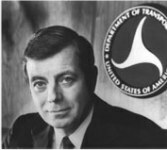 January 23, 1981 - Andrew Lindsay "Drew" Lewis became the 7th Secretary of Transportation. 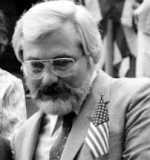 Mr. Lewis at one time served as chairman of the Pennsylvania Republican Party's finance committee, and was the GOP candidate for Governor of Pennsylvania in 1974. He received a B.S. from Haverford College, Pennsylvania; Master of Business Administration from Harvard University and did postgraduate work at MIT. The FAA made a $40 Million counter-offer which included a shorter work week and a 10% pay hike for night shifts and those controllers who doubled as instructors. 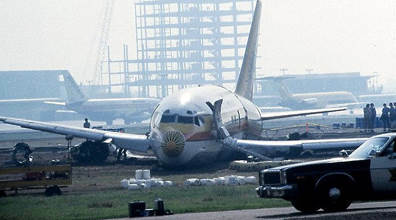 February 17, 1981 - Air California B-737 crash landed after touching down with the landing gear unlocked. The pilot was instructed to go around, because a controller had cleared another Air California aircraft for take-off on the same runway. The B-737 pilot applied power and retracted the landing gear. The fuel governors on the engines slowed the engine spool-up due to the hot outside air temperature, and the aircraft sunk on to the runway while the landing gear was retracting. No fatalities. April 22, 1981 - President Ronald Reagan named former CEO of Piper Aircraft Corp., an aeronautical engineer and Marine test pilot, J. Lynn Helms as the 8th FAA Administrator. Helms was a U.S. Navy test pilot and was awarded the U.S. Marine Corps Air Medal and the USAF Air Medal with Oak Leaf Cluster for Combat and Exceptional Service during the Korean War. He retired from the Marine Corps as a Lieutenant Colonel. 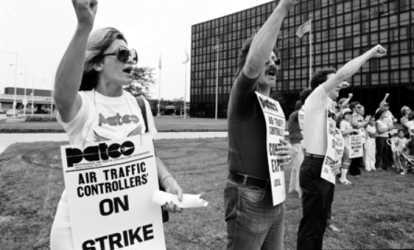 April 28, 1981 - After 37 negotiating sessions with the FAA, PATCO representatives walked out of the contract talks, claiming that the agency was not responsive to their proposals. PATCO had submitted its bargaining proposals in January and negotiations started the following month. PATCO's proposals for a 32-hour work week and separate pay scale for controllers were opposed by the Office of Management and Budget. April 30, 1981 - People Express Airline began operations as a spartan, no-frills service from Newark International Airport, NJ, with flights to Buffalo, Columbus, and Norfolk and later to Florida. The airline used a simplified fare structure with all seats offered at the same price and paid in cash aboard the aircraft early in the flight. In 1983, People Express began non-stop service at $149.00 each way to London's Gatwick Airport with a leased B-747 and became an instant success with all flights sold out for several months within 24 hours of being offered. People Express merged into Continental Airlines in 1987. 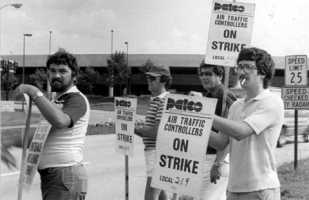 May 23, 1981 - At its annual convention in New Orleans, LA, PATCO set a June 21 deadline for reaching agreement on a new contract with the FAA. PATCO president Robert Poli said if agreement was not reached by that date, the union would poll its members for a strike vote. Newspapers quoted Poli as vowing that "the skies will be silent" if FAA's negotiators did not "come to their senses." 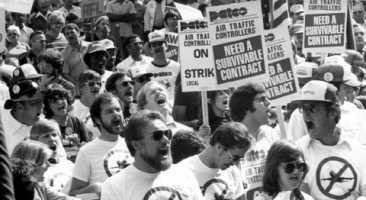 June 22 1981 - The DOT and PATCO representatives reached agreement on a tentative new contract, thus averting a threatened nationwide strike by PATCO. Secretary of Transportation Drew Lewis and PATCO president Robert Poli had gone back to the bargaining table, prompted by a letter to Poli from 36 Senators, stating that a strike by PATCO "will do nothing to further your goals of increased pay and changes in working conditions." 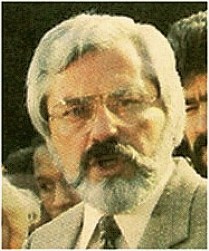 The bargaining sessions were joined by Federal mediator, Kenneth Moffett, lasted 25 hours, with the last session running past 3 AM. A 'responsibility' differential that would give controllers 42 hours pay for each normal 40-hour week worked. An increase in the night differential from 10 to 15 % of base pay. The exclusion of overtime, night differential, and Sunday and holiday pay from the limitations of the Federal pay cap. A retraining allowance equivalent to 14 weeks of base pay for controllers who became medically disqualified after five consecutive years of service at the journeyman level or above and who were ineligible for retirement or disability compensation. The first-year cost of the total package, which included a cost-of-living raise of 4.8 % due Federal civil service employees in October, came to approximately $40 Million ($4,000. per controller per year). PATCO had been seeking a package that would have cost the government in excess of $700 Million per year. 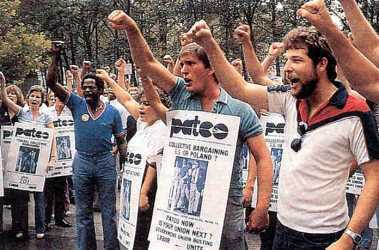 July 2, 1981 - PATCO's nine-member executive board recommended unanimously that the union's members reject the tentative contract agreed to by Poli and Lewis. Poli also voted to reject the contract, although he had stated that he was pleased with the settlement at the time of its negotiation. 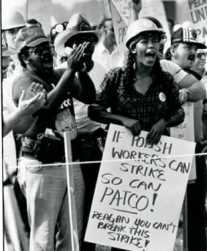 July 31, 1981 - PATCO president Robert Poli announced at a press conference in Washington that his union would go on a nationwide strike beginning on Monday, August 3, 1981, unless the government met PATCO's demands. 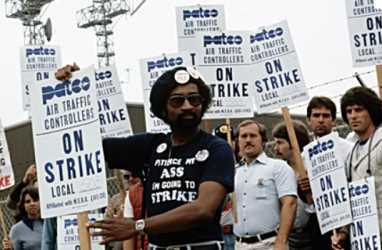 August 3, 1981 - The strike of the Professional Air Traffic Controllers Organization (PATCO). At issue were a number of economic issues, including higher wage scales and other benefits. Although PATCO officials and Secretary of Transportation Drew Lewis did reach a tentative agreement, PATCO's national officers advised union members to reject it. Because 95% of the membership refused to ratify the new pact led 12, 300 controllers to walk off their jobs in defiance of Federal Law and their oath not to strike. The strike, beginning at 7 AM (EST) grounded approximately 35 % of the nation's 14,200 daily commercial flights. 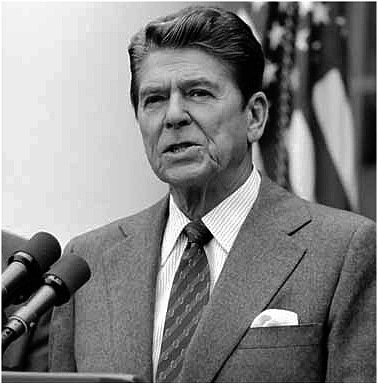 President Ronald Reagan reminded the strikers that they had signed an oath not to strike against the government, and gave them 48 hours, or until Wednesday, August 5, to get back to work or be fired. 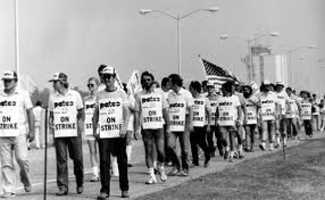 The government moved quickly on 3 fronts -- civil, criminal, and administrative -- to bring the full force of the law to bear on the strikers. Asked the Federal Labor Relations Authority to decertify PATCO as the bargaining agent for the 17,200 controllers and controller staff members. Moved to impound the union's $3.5 Million strike fund. Filed criminal complaints in Federal courts in eleven cities against 22 PATCO officials. Sought restraining orders against the strikers in 33 courts. 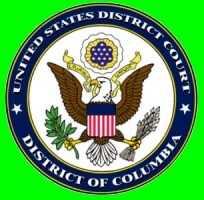 A U.S. District Court for the District of Columbia found the union to be in contempt for failing to obey the order directing the controllers to return to work, and imposed an accelerating schedule of fines totaling $4.7 Million if the controllers failed to report to work ($250,000 for Tuesday, August 4; $500,000 for Wednesday, August 5 and $1 Million a day for the next 4 days). The majority of striking controllers ignored the order, and 11,438 were fired. PATCO officials faced enormous fines and the union was decertified by the Federal Labor Relations Authority. 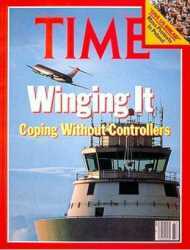 While 2/3 of the controller work force remained on strike, the FAA was still able to keep a majority of the nation's 14,200 daily commercial flights in the air by appealing to the sense of dedication of the remaining controllers and supervisory personnel, using a system of flow control, and military controllers on loan. 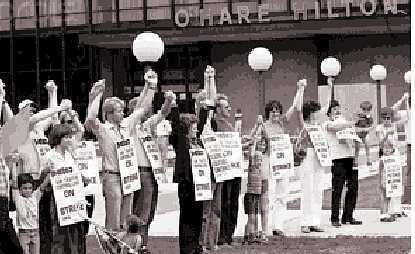 The FAA's contingency plan minimized the strike's effects. About 3,000 supervisors joined 2,000 non-striking controllers and 900 military controllers to keep the system working. The airlines reduced scheduled flights by 60% during peak hours and 60 small towers were shut down indefinitely. The FAA Academy at OKC increased graduates (of the 17-21 week course) to 5,500, as more than 45,000 people applied within four weeks of the strike. 60-hour work weeks during recovery did not reduce air safety as PATCO predicted. Limited traffic and extra monitoring by the 33,000 Air Line Pilots Association also diminished the risk of an air accident. 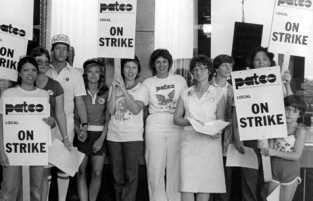 PATCO did not receive much public support as they sided with the government and expressed little sympathy for individuals whose earnings were already well above the national average. 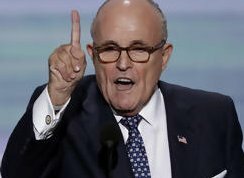 Poli accused Regan of "trying to break the union," while Assistant Attorney General Rudy Giuliani defended the President's decision, calling the strike "a blatant violation of federal law." The government did not hesitate to replace controllers, a decision that would redefine labor relations for years to come. PATCO leaders were jailed for ignoring court injunctions against a strike, and the Justice Department proceeded with indictments against 75 controllers. Federal judges levied fines of $1 Million a day against the union while the strike lasted. 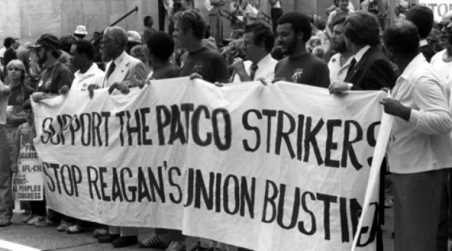 One journalist wrote that "...the decisive manner in which Reagan handled the PATCO strike convinced many Americans that he was 'the kind of leader the country longed for and thought it had lost: a strong president' -- a sharp contrast that his predecessor Jimmy Carter had been too indecisive. 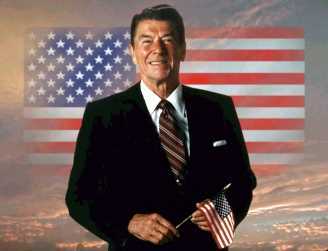 Reagan stressed that he derived no satisfaction from firing the controllers. 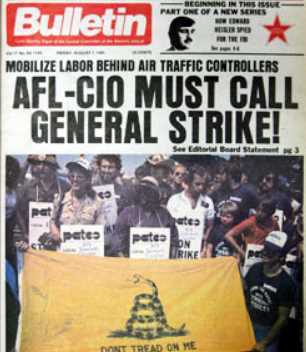 He pointed out that he was at one time president of the Motion Picture Guild, and lifetime member of the AFL-CIO, and aware that PATCO had been one of the few unions to support his presidential bid, but no president could tolerate an illegal strike by Federal employees." The FAA announced it would hire approximately 1,500 temporary employees, including furloughed airline pilots, to assist in replacing air traffic controllers fired for striking. The temporary employees would not control traffic, but would perform duties related to flight strip distribution and other controller support functions. 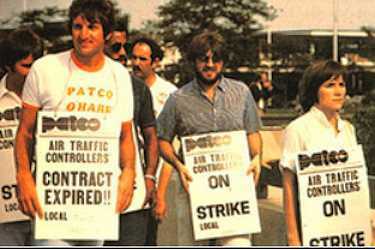 October 22, 1981 - The Federal Labor Relations Authority decertified PATCO. Administrator Helms, and Secretary Lewis commissioned a 'Jones Report' which identified significant 'people problems' in the FAA, affecting employee morale and effectiveness. The FAA then developed and established an agency-wide human relations program. December 31, 1981 - The National Transportation Safety Board (NTSB) reported that 1981 was the second consecutive safest year in history for scheduled air carriers without a crash. December 31, 1981 - Robert E. Poli resigned as president of PATCO.